Have you seen Hazel Blomkamp’s new book yet? It’s called Crewel Twists, and it’s a beauty! 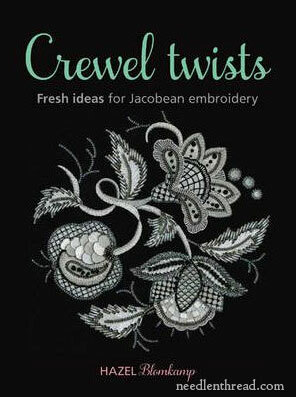 Published by Search Press, Crewel Twists is already available for purchase in the UK, and will be released to the rest of the world soon. Crewel Twists is not your typical take on traditional crewel, although the techniques are much the same. Instead, Hazel combines beads and regular floss in her designs, so what you get are crewel-looking design, stitched with floss and beads – and wow! What a beautiful combination! 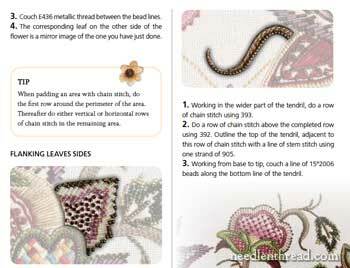 If you like the look of Jacobean embroidery and you like regular surface embroidery, using regular floss and combining lots of stitches and beads for embellishment, you will love this book! The book begins with all the needful information about working an embroidery project, clearly laid out and discussed in a forthright manner that’s clear and easy to understand. One aspect of the book that I really like is that Hazel writes in a very direct, matter-of-fact voice. There’s no pretension here; there’s no highfaluting mumbo-jumbo about anything. It’s easy to swallow direction, whether you’re a beginner or an expert. She peppers the book with little tips throughout, even in the introductory material. Her tips are direct and to the point, like this one: “You spend many hours working on a project. Use the best quality material you can afford.” Boom. She says it. There’s no beating around the bush here! And I like that! There are several pages on threads, needles, beads, and supplies in general – all useful information, discussed easily and comfortably. There’s a nice bit on tools! I like tools, and I like to see them covered in a book. 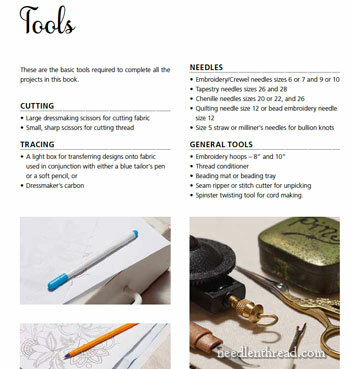 Sure, you only need a few tools to embroider, but it’s good to know what other helpful items to have on hand to make your stitching sessions a success. 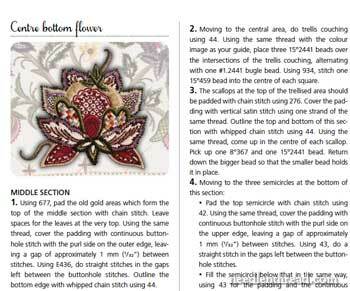 After the introductory material, you’ll find a stitch gallery, with over 45 stitch diagrams and explanations. 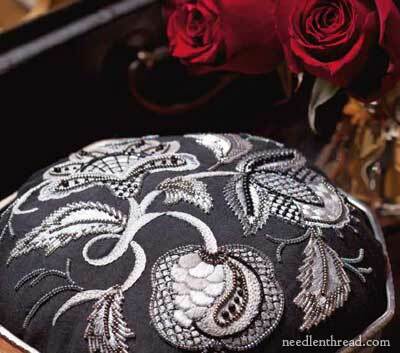 This include regular surface stitches, beading stitches, and needle lace stitches. And then…. and then … prepare yourself for the projects. They are elaborate, but accessible. Some are a riot of color, others are subtle elegance. There are six projects in all. At the beginning of each project, you’ll find color photos of the finished piece. This particular piece was made into a fire screen. It’s stunning! For each project, there’s a complete materials list, with all the threads, fabric, and tools required. 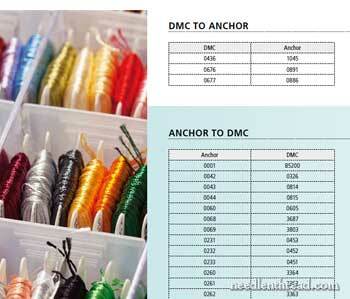 The thread colors correspond with Anchor threads, but in the back of the book, conversion charts for DMC are available. The project instruction is made up of a color photo of the completed stitch area focused on in the instructions, and in the accompanying text, the reader is taken step by step through creating each little section. 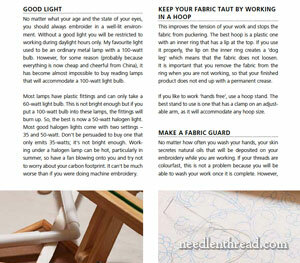 There are highlighted tips throughout, to help the stitcher through the project. See what I mean by a riot of color? This photo gives you a close up sense of the variety of stitches and the way beads are used to embellish several of the projects. Fun! This particular project is worked in grays and whites and silvers and black – an elegant combination. 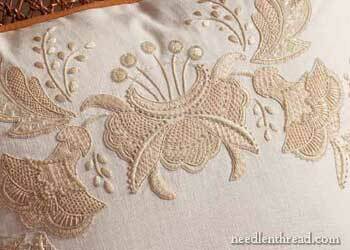 Another elegant piece – a Jacobean-like design, worked in different needle lace stitches, in ecru-on-white. Very pretty! And back to color! I love this piece – it’s straight embroidery, in a variety of stitching techniques, and so pretty! 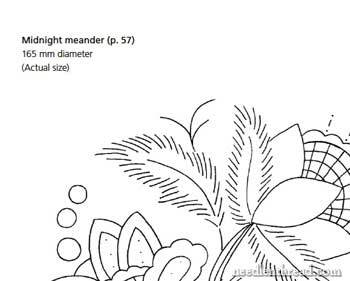 … and, of course, you’ll find all the patterns, in easy-to-trace line drawings that can be enlarged on a photocopier, when necessary. Crewel Twists is a beautiful book of beautiful stitchery! I thought it was fun to read, I think the projects are really interesting twists on Jacobean designs, I like the fresh look of the projects and the incorporation of beads and multiple types of stitching that help make the projects fun and challenging, without being daunting. If you’re a lover of Jacobean styled designs, and you like embroidery projects that incorporate a variety of stitches, and you have a penchant for beaded work, I think you’ll like this book! In the US, you’ll find Crewel Twists available here through Amazon. 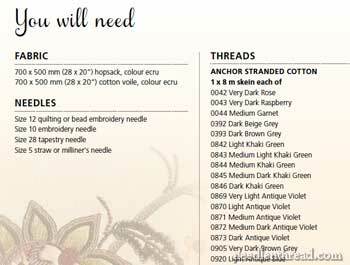 Worldwide with free shipping, you’ll find Crewel Twists available here through Book Depository. How beautiful! Thank you for the review, Mary. I absolutely love, love, love Jacobean crewel. I have done one kit project before that used floss and beads also, but these project photos are to die for! Will definitely have this book on my wish list!! Thanks again for sharing! LOVE! I’m beginning work on my first big crewel project and I adore this approach. This book is not on my wishlist, but on my MUST HAVE list. Hazel also writes a column for a local bi-monthly craft magazine. She is so funny and like you say, straight forward. It is such a blast to read. Hazel has been teasing her followers on Face book for over a year now with her book and at long last it will be available soon in my country too. Thank you for the lovely review and sharing all that YUMMY stitching with us, I so enjoy reading your postings! I just love Hazel! She is such a sweety. Her work is lovely eye candy! I commented on a picture in her Facebook account. She responded right away answering all my question’s. Don’t forget to check out the tassles on her website!!!! They are just to drool over. Ohhh my goodness how beautiful! This one called my name, so I just ordered it. 🙂 Thank you for the wonderful review! Great review! I love your pictures. This book is going on my birthday list. Mary, this looks like a book that indeed is a must have! I bought a “purse” and its preprinted with the pattern but has NO directions!!!!!!!!!!! I keep pulling it out of my stash and looking at it but I am not a crewel stitcher so I am lost. I put it back. This book may be just the thing foe me to pull it out and actually DO it. Thanks for the report! I’m ordering one today! Looks like a wonderful book. Did anyone else read the title of the post and wonder why Mary was reviewing a mystery novel? This would be a great title for one. YES! That is exactly what I thought! What a beautiful book! I usually work my own designs but this would tempt me to do hers. I love the monochromatic treatment. I will watch out for the arrival of this book in Canada. Thanks for telling us about it. Thank you, Mary! I cannot WAIT to get this book. I, too, love Jacobean styled florals, tapestries, etc. Thanks for your very thorough review Mary! What a beautiful book, one that I will definately be ordering ASAP! I find it difficult to limit myself to one type of material, so combining several different media into one beautiful work of art REALLY appeals to me. Thanks so much for taking the time to share this beautiful book with us. What a beautiful book!! I have already ORDERED it! It’s not available until March 1 so I will have to wait until next week for it to get here. I can’t wait to look at all the colors she uses. I’ve loved the look of Jacobean design long before I thought to find out what it even was.Now that I’m attempting my hand at crazy quilting (oh, that ladder’s bottom rung is so low! ), I’ve known I want to eventually do some little Jacobean inspired dembellishments in those projects. With beads and other threads, this sounds like my go-to book. Thank you so much for reviewing this book. 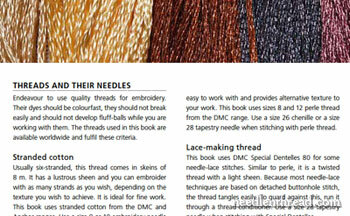 I noticed it on the RNS website a few weeks back as I was looking for the RNS Handbook of Embroidery. I was hoping you might have a review coming up on this, and am not disappointed. The book looks delightful, with the use of color and technique. I love the tone on tone with the needle lace stitches. It is going on my Amazon list as soon as they have it! Mary, thanks so much for reporting on the book, Crewel Twists. I absolutely love crewel work and I love beads, and teach bead embroidery in my area. I will definitely look for this book. The Book Depository is offering a 34% reduction in price, and free delivery worldwide. This means you can get the book for £9.89! What a cool way to make update old designs and techniques! I LOVE the cream needlelace. Do you have a link to a US site that may carry the book? I would love to get it – and maybe convince my library to carry it! The book depository ships for free world wide. I live in Canada and order from them regularly. I highly recommend their service. Mary has listed the link at the very end of her article. Stunning! 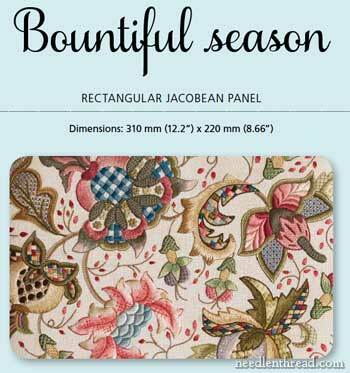 This looks like a must-have for those of us who love Jacobean designs. Thank you so much Mary for your review, this book seems to be a true marvel! Yikes! I succombed and bought it through Book Depository. I am particularly intrigued by her black, grey, white and silver design – but am also a big fan of color, too. What’s not to like? Thanks, Mary, for the great review. PRECIOSO OJALA EN Colombia lo tengamos pronto,gracias. I ordered this! It’s exactly what I’ve been looking for! Thanks Mary for pointing me in the right direction-without even knowing where I was headed! I cannot tell you how excited I am to see this book in person. Hi Mary, thanks for the lovely review, I went to Hazel’s site, discovered that there is a huge hobby show on this weekend in Johannesburg and that Hazel’s designs will be available at the DAAFT stand. So I went there this morning to discover that Hazel were there herself, selling the book at a special show prize and autographing them, so of course I bought a copy immediately :-). Thanks again it is a stunning book!!!! Color and beads – that’s what I like. This book does them both well – I want it!!!!!! Thank you for such a review. You are incredible. This book looks incredible. The flavor of Jacobean with some modern twists. I especially like the monochromatic designs. I’m looking to do more surface embroidery on needlepoint canvas, but would like to evolve my stitching onto fabric besides linen. I would be so happy to win this book to add to my collection because I don’t have one so well presented. I especially like the complete directions and how they are presented for each project. They appear that they are presented all together so the reader doesn’t have to refer back to another page. Thank you for your all conclusive review. This is a beautiful book! I like the variety of projects, stitching techniques, and step by step lessons. I learn all needlework techniques from books, magazines, or online sources; it seems that one can learn a lot from this book. Thank you for your review. I enjoyed everything about the book, especially the designs. It sparked my memory of seeing the pillow cases that my grandmother and her mother did. Especially the same designs in heavy threads. I would like to try those stitches now that I am retired. This book has been on my wish list since you reviewed it in February. I made a pillow with crewel embroidery many years ago and still love to see it sitting on my rocking chair. It never occurred to me that Jacobean style embroidery could be done any other way. 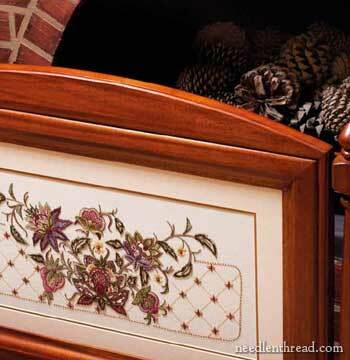 I love the idea of using embroidery threads and embellishment. I particularly like the ecru on white design. Thank you for bringing this lovely book to our attention and to Hazel for offering her autographed book for a giveaway. I would love to own this book. If I don’t win this , I will buy one..but try to wait to buy it at the half-price bookstore. I like the way it is written. Simple and to the point; A list of supplies, step one, step two, written instructions and the final product beautifully displayed. . Stunning! The book is breath taking. The silver, gray, black, and white piece cradled in silver dish is so creative. The other pieces are just as beautiful, but I love, love, love this look. What a gift! I have embroidered for years, but I am very anxious to take on a more complex project right now. This beautiful book looks like a great “way in” to a special church project or something unique for my home. I’m anxious to learn new techniques and to really become absorbed in an embroidery challenge. After finishing a 30 yr. teaching career I returned full time to needlework.I learned to make floral themed quilts with embroidered center pieces. Your website is extremely helpful in this regard. This book is inspirational,and I love the fact that the materials, stitches etc. are so well orgamized. Color photos of the finished pieces can be carried to the thread(s) and fabric store. Your reviews read like a phone conversation with a friend! Thanks for all your help. i just received my copy! Hello Mary, I’m looking at your review of Hazel Blomkamp’s book Crewel Twists online. I bought 2 patterns and the book from her website, http://www.blomkamp@futurenet.co.za, in 2012. I emailed her several times with questions and she very promptly and kindly responded. I’m trying to get back on her website to order more but I’m unable to pull it up. I remember her telling me at some point that her website address was being changed but I can’t find where I made note of it. Anyway, I’m hoping you can give me some guidance/suggestions as to how to contact her, either via email or her website. Have you heard about the new book “Crewel Intentions” by Hazel which is about to be out at the end of June? Just a quick message to let you know that I started the project in silver shades. This is really interesting, and not so difficult to stitch. I love this project ! You may see my progress on my blog. Thank you so much for this review Mary. I actually saw your review for Crewel Intentions and you mentioned there that this was the first book prior to Crewel Intentions. I ordered the Crewel Twists (Amazon USA) and received it a few days ago. Oh my heck! This book is so beautiful. 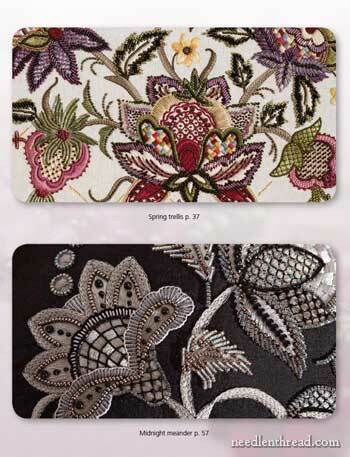 It is so full of fabulous ideas I know it is going to impact my surface embroidery as I learn from you. I love the different stitches and how she layers many of them. And the beads are great. I am going to design something using her technique and see if I can incorporate it with some counted cross stitch on linen. I always seem to have to do things my way and this is right up my alley. Hi, Ayesha! The projects are a little more complicated than beginner level, I think, but…you can always make modifications to them as you work them. 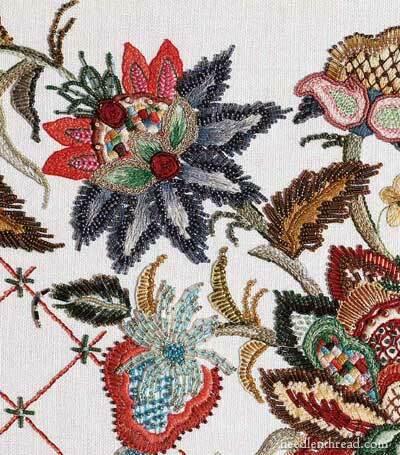 The designs are terrific, if you like these Jacobean type designs, and they’re very easy to adapt to different types of stitches. So you could always use the book that way, until you felt like you were ready to tackle one of the more complex projects. Or, you know, if you’re determined enough, you can always launch right into one of the projects in the book, and look at it as a learning experience or exercise. I don’t think you can go wrong with the book, if you like the design style. There’s lots of scope with projects like these! thanks so much for the prompt and thoughtful response! i think i will give it a go… got to start somewhere and it would be nice to sit down with my work and a book, instead of looking up stitches on my iphone as i work! It would be hard to pick. I want to learn all the stitches. What a beautiful book.